Dominant streaks: Clemens, Johnson, Pedro… and who? Back on June 29, Seattle Mariners ace right-hander Felix Hernandez allowed only one hit over eight shutout innings to defeat the visiting Cleveland Indians 3-0, giving up just Lonnie Chisenhall’s fifth-inning single. For Hernandez, who walked three, it was his ninth consecutive start where he had pitched at least seven innings while giving up two runs or fewer. During that stretch, Hernandez was 6-1 with a 1.30 ERA with 77 strikeouts and just 10 walks over 69 innings. In those nine outings, he surrendered a total of 42 hits and one homer. The nine consecutive starts with seven or more innings with two or fewer runs is a Mariners club record, and in fact is a rare feat in baseball. According to Baseball-Reference.com, Tom Seaver holds the longest such streak in big-league history, going 13 straight starts in 1971 where he allowed two runs or fewer while working at least seven innings. From 2001-2013, only six pitchers had such a streak of at least eight consecutive starts, which shows how rare Hernandez’s feat has been. As for the 1990s? Well, only five pitchers in that decade had a stretch of eight straight starts where they gave up only two runs or fewer while pitching at least seven innings. 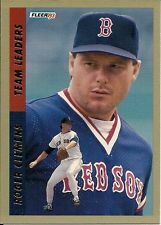 The list includes fireballers Roger Clemens, Randy Johnson, and Pedro Martinez. You would expect to see those names, as Clemens, Johnson, and Martinez were three of the most dominant pitchers in the 1990s, as well as in baseball history. Surprisingly, Ed Whitson accomplished this feat during the 1990 season, when he went 5-0 with a 0.99 ERA in those eight consecutive starts from July 25 to September 2 for the San Diego Padres. During his streak, Whitson walked just eight batters in 63.1 innings. Who was the fifth pitcher to accomplish that rare feat in the 1990s with eight consecutive such starts? No, not Greg Maddux . Not Tom Glavine or John Smoltz. Not Mike Mussina. Nope. The fifth guy who did it was Los Angeles Dodgers knuckleballer Tom Candiotti, who accomplished the feat in 1993. During a season which saw the Dodgers finish 81-81, the highlights were rookie Mike Piazza’s monster season and the team’s 12-1 rout over the Giants on the final day of the year to knock San Francisco out of the postseason. But there was also the overlooked Candiotti and his pitching throughout the summer, as he had a 1.85 ERA in 22 starts from May 1 to the end of August. Entering play on September 1, Candiotti’s 2.43 ERA was the best in the major leagues, marking the second time in three years that he had the ERA lead at one point in the final weeks of the season. The knuckleballer’s streak of eight straight starts with two or fewer runs and seven or more innings took place from July 18 to August 25, when he pitched to a 1.32 ERA over 61.1 innings while allowing only 17 walks and four home runs. Included in that streak was a 2-1 win on July 28 in San Francisco, where he held Giants sluggers Will Clark, Matt Williams, and Barry Bonds to one hit in 10 at-bats. Candiotti went only 5-0 in that streak because he didn’t get enough support in the other three starts. On August 9, he gave up two runs over eight frames but the Dodgers lost 3-2 in 11 innings against Colorado. (The Dodgers couldn’t touch Rockies right-hander Greg Harris, who would be 4-20 with a 6.60 ERA in a Colorado uniform in 1993-94.) On August 20 in St. Louis, Candiotti allowed two runs over seven innings but left the game trailing 2-0 against rookie Rene Arocha, before the Dodgers rallied for three runs in the ninth to spare him a heart-breaking loss. Five nights later, he gave up one run on four hits over eight innings against Pittsburgh, only to leave the game trailing 1-0 to Pirates rookie Paul Wagner. The Dodgers tied it in the bottom of the eighth but ultimately lost 2-1 in 12 innings. That performance in that last outing on August 25 lowered Candiotti’s ERA to 2.43, tops in all of baseball. Certainly, when you think about long stretches of dominant pitching, you think of guys such as Felix Hernandez, Roger Clemens, Randy Johnson, and Pedro Martinez. Ed Whitson? Well, at least he threw a fastball. Tom Candiotti, a guy who threw a knuckleball? You would have never figured he had had such a long run of great pitching. But it happened. Back in that underrated 1993 season. Even in Maddux’s dominant 1994-95 seasons, when he had sub-2.00 ERAs of 1.56 and 1.63, respectively, he didn’t have that many starts in a row with seven or more innings with two or fewer runs allowed. The longest streak he had in those seasons lasted “only” a half-dozen. Maddux had six consecutive such starts in 1994, and again six straight in 1995.